Cruise worry-free toward the sunset, or relax with friends and good times while enjoying breathtaking sights of nature. The Mary Elizabeth whisks you away in sophisticated comfort – you might find yourself chatting, glass in hand, on the Sun Deck, perched next to the Captain on the Bridge, or looking out over waters with an enviable view from the bow. Forty-three feet of expertly designed, Hatteras-crafted, melt-into-serenity space means The Mary Elizabeth provides plenty of escape hatches. 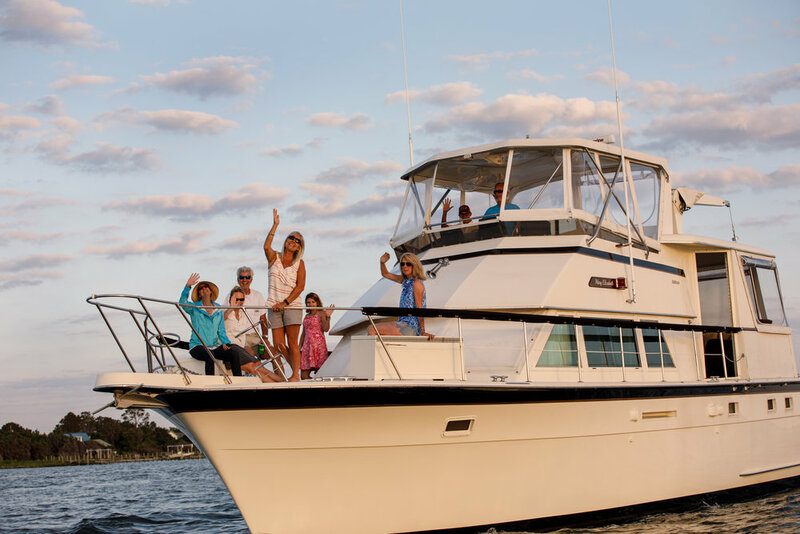 As Shine On Charters’ premiere motor yacht, The Mary Elizabeth offers peace, and quiet, and memories... it’s about a three-hour ride that lasts a lifetime – with just the right balance of Southern hospitality, delicious views of Ocracoke Island, and getting away from, well, just about everything. The Hatteras name speaks for itself – impeccable attention to detail, unparalleled craftsmanship – it’s viewed as the most prestigious of yachts. Hatteras Yachts is a North Carolina based company. And, although Captain Russ and his wife Michele first discovered The Mary Elizabeth up North, they knew this stately vessel belonged back in Southern waters, choosing historic and beautiful, Ocracoke Island. 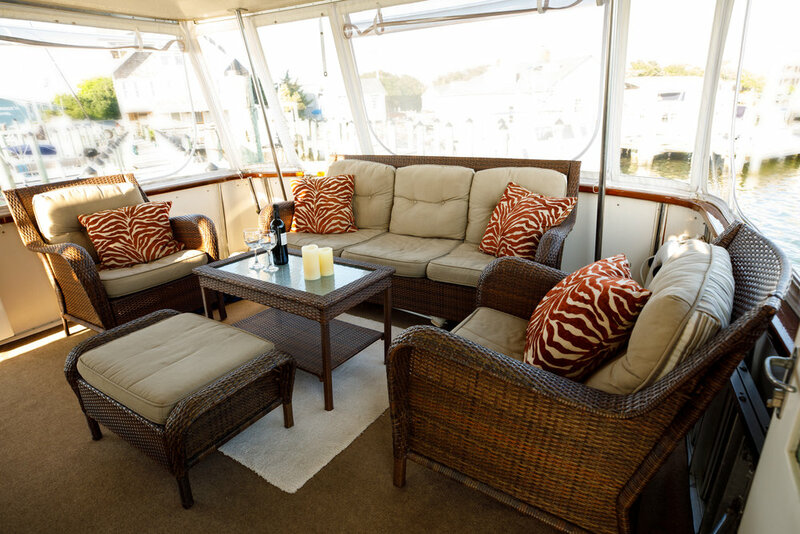 Shine On Charters showcases Hatteras’ celebrated mastery via teak-trimmed railings, soft-spoken elegance and a layout designed for entertaining. 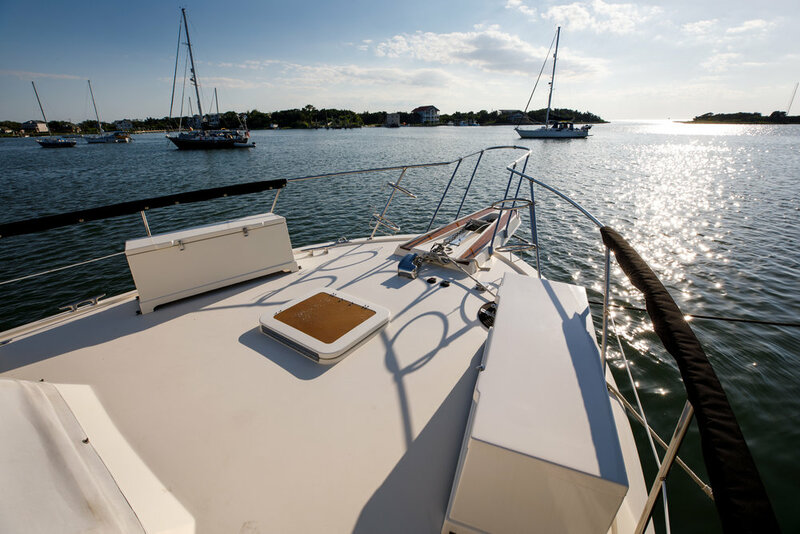 Classic yet casual, The Mary Elizabeth is the premiere motor yacht for charter in the Ocracoke area. 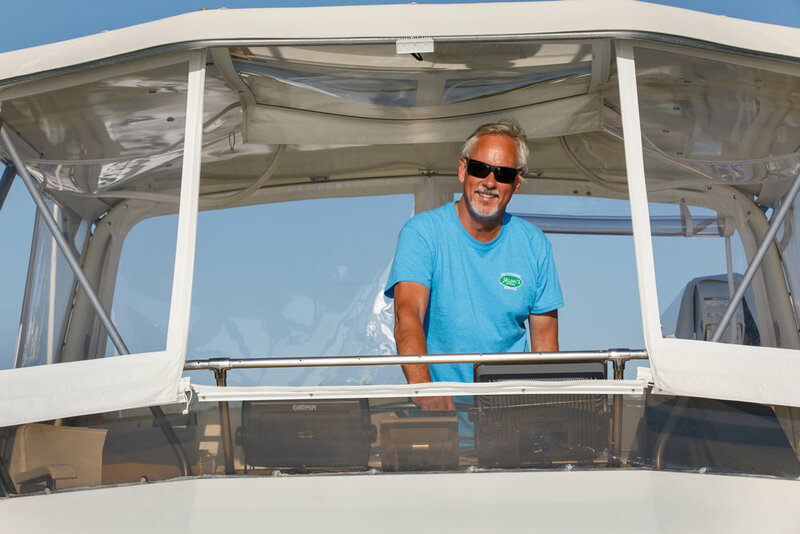 Captain Russ has held his Captain’s certification for more than a decade and has been piloting, sailing, navigating and delivering a variety of boats ever since. 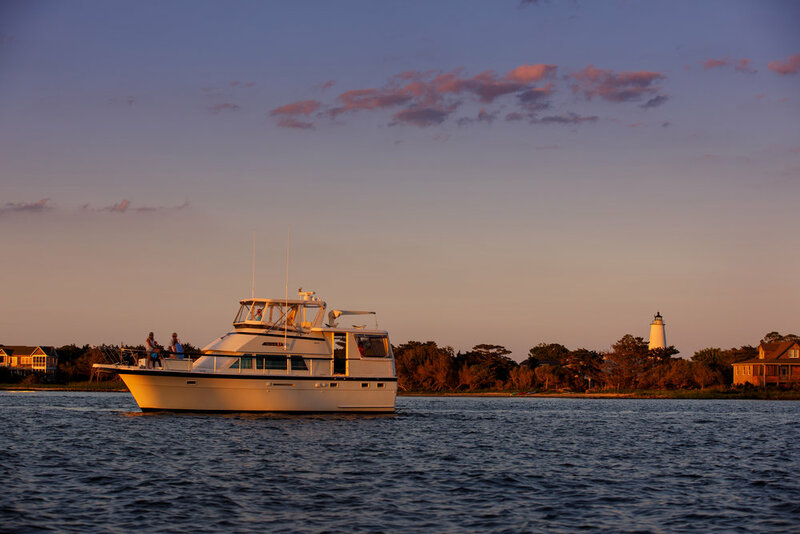 He knew Ocracoke Island, with its beauty, charm and exciting history, was the perfect place to offer enchanting sunset cruises. It is the jewel of the Outer Banks and only accessible by plane or boat. This gem in the Atlantic has raw and untamed gifts of nature. And, since everyone has a bit of the pirate spirit in their souls, Ocracoke offers an incredible history guaranteed to “shiver your timbers”. Sir Walter Raleigh ran aground in 1585 on a sandbar in Ocracoke Inlet and had to land on the island for repairs. First known as Wocco con, it later became Ococcock and soon was known as Ocracoke. In 1715 it became a port, but as it grew in importance, pirates became a major hindrance to shipping. The infamous pirate, Blackbeard, was captured here in 1718 and was killed in a bloody duel by Lt. Robert Maynard of the British Navy. His death and the capture of 15 crewmen, effectively ended large-scale piracy all along the Atlantic Coast. Captain Marcus Lawson is a certified US Coast Guard Licensed Captain and Ocracoke Native. For the past 5 years, he has operated his own business running clamming/ flounder gigging charters. He is also a waterfowl hunting guide. He is knowledgeable in navigating the waters of the Pamlico Sound and the local history of the area. He enjoys sunset cruises in Ocracoke as much as you will. 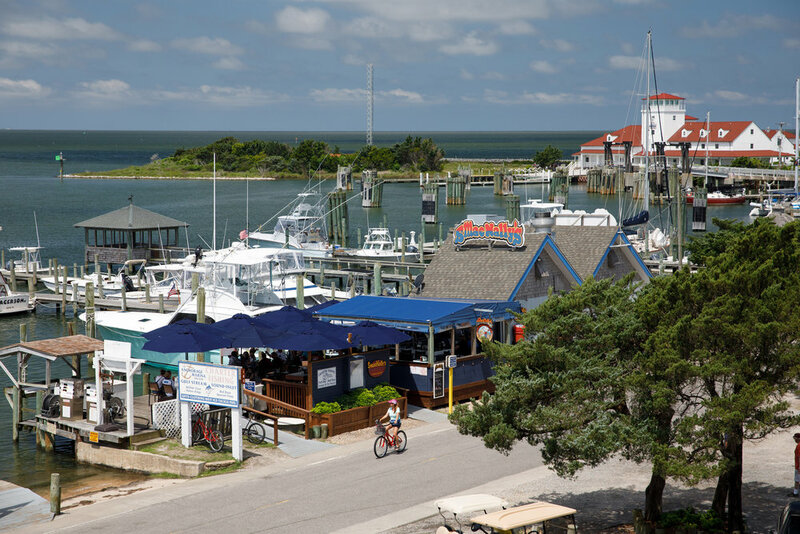 Today Ocracoke’s historic village streets are alive with events and activities, as well as sixteen miles of unspoiled, pristine beaches, wild nature and the famous ponies. Although their origin is unknown...many interesting stories are bantered about. But this is just the beginning of the “Ocracoke Things To Do” list. There are countless water and land activities to enjoy, as well as state parks, aquariums, museums, shopping and, of course, a visit to the Ocracoke Lighthouse! The Outer Banks Activities are practically limitless and you will find their diversity will easily please everyone in your group! Things to do at the Outer Banks are simply too numerous to list, but you won’t run out of things to see and activities to enjoy! The villages, the Wright Brothers National Memorial, the various lighthouses and much more are here for you to explore. Q: Do I have to book cruises in advance? A: Advance purchase is strongly recommended. To maximize your chances of getting the day and time you prefer, please book well in advance. We can accommodate up to 6 guests for the sunset cruise. Q: Can I get a refund or reschedule my cruise after paying? A: Because we are guaranteeing your trip on the cruise date, trips cannot be refunded nor rescheduled once purchased. Please refer to our weather policy noted below. Q: Do you ever cancel cruises due to bad weather? A: The cruise usually runs in light rain and other moderate weather conditions, but we may cancel the activity before the start time in the event of severe or unsafe weather conditions. If we cancel the event, cruisers will be allowed to reschedule the trip (subject to availability) or receive credit for a future event. Q: What happens if it starts raining while we're on our cruise? A: Don't worry, some of our most fun and memorable trips have taken place in less-than-perfect weather! If we're caught in a rain shower, you can go back and hang out on the sun deck or up on the bridge with the Captain. Q: Is food served during the cruise? A: Food is not served on the cruise, but you’re more than welcome to bring your own snacks or picnic. However, we ask that you do not bring large hard coolers on board. Q: Can I bring my own drinks aboard? A: Yes, guests are allowed to bring their own beverages including beer or wine. We have a wet bar and bar fridge on the sun deck to keep your favorite beverages cold. Guests must drink in moderation. Guests are always responsible for their actions. The captain is in charge and legally responsible for the actions of all guests. He reserves the right to cut the charter short and return to the dock if any guest becomes unruly. Safety is always top on his list of considerations. A: We suggest that you dress comfortably, and weather appropriate. Keep in mind that it is usually 5-10 degrees cooler on the water. Soft-soled shoes are also recommended. Q: How steady is the cruising? Am I likely to get seasick? A: The Mary Elizabeth is a solid, smooth riding motor yacht and it is uncommon for our guests to become seasick. While we cannot officially advise you to take medication, if you normally take anything for motion sickness, you may want to consider light medication. Q: Are any areas of the ship covered or air conditioned? A: No air conditioning, but the sun deck is covered and has a nice sofa, cocktail table and chairs. The natural sea breeze provides our fan. Hats, sunglasses and sunscreen are recommended. Drink plenty of water on hot days to stay hydrated. Q: Do we see dolphins and other sea life or birdlife? A: Most of the time you will see plenty of sea life and birds. While we do not guarantee it, sightings often include dolphins, pelicans, and other local wildlife. Q: Where does the cruise finish? A: Our cruise will end at the Anchorage Marina, the same marina from which it departed. Q: Is there a restroom on the boat? Q: How fast does the Mary Elizabeth go? A: We typically cruise at 6 to 8 knots. We encourage you to contact us with any questions you might have. We love to help our passengers in any way we can! Charter rates start at $300. The rates vary depending on how many people and how long you want to cruise. We will accept your credit card and process it at the Anchorage Marina, but charge an extra 5% for using a credit card. Order appetizers and food to bring onboard from sMacNally’s located at the dock.